Guest Interview: Book Cover Designer Sharon Benton! For our guest interview today, we’d like to introduce you to Sharon Benton. Sharon is a Book Cover Designer we met at the Northwest Book Festival in July. We really enjoyed meeting her and checking out her work. She creates eye-catching book covers as well as other graphic design products at what we consider to be very reasonable rates. If you’re shopping for a new book cover or just a cool image for your profile or website, you should definitely consider Sharon! Tell us a bit about yourself and how you got into cover design. I worked as a technical writer until 2001, when I had chance to pursue a career as an artist. I spent 5 fun years selling my textile art at local galleries and shows. Then, we had the chance to live in Europe for 3 years. When we returned back to Seattle, I decided to combine my love of the technical and the artistic and pursue a degree in graphic design. A couple of years later, a former office mate from my tech writing days called and asked if I would like to design her next book cover, and I was hooked! 2. Can you describe your process to create a book cover? How much collaboration do you do with the author? I have a questionnaire that helps us get to know each other and throughout the process we keep in touch via phone or email. If I can’t read the book, I ask the author to summarize it and tell me about the main characters. Some authors have a very clear vision of what they want the cover to look like, or a certain piece of artwork they want to use. Other authors prefer to let me come up with a design. I usually create 2 – 4 concepts, taking into consideration the genre, the story line, and the characters. I research appropriate photos or illustrations and choose a typeface that fits with the design. Here are three designs for Maryellen Brady’s book “Dragon Blue” (she chose the third one). How long does it take to create a complete book cover? That’s a good question, for which I don’t have a really good answer! There are lots of factors determining how long it takes, such as whether the author has existing artwork or needs something custom, what kind of revisions are made during the process, etc. I will soon be offering “Book Covers to Go” – ready made book covers that require adding only the author’s name and title, that I can deliver next-day. Otherwise, you can expect a cover to take a few days to a few weeks, based on the complexity of the design, researching images, and number of revisions. What do you consider key to a successful cover design? I like to say that your story is one-of-a-kind, and so your book cover should be, too! The cover does not need to be a literal translation of the character or the story, but it should reflect the style and genre of your book. It’s also important that the typography style is a good match for the genre and the cover art. And with the popularity of e-books, another consideration is how the cover will look as an online thumbnail. You want to be sure the design is eye-catching at 300 x 500 pixels…this means making the text easy to read with good contrast from the background. For example, white text on a black background is easy to read, but red text on black could be harder to see. What other design services do you offer? What are you working on now? In addition to book covers, I also design web sites, promotional materials, and am an avid photographer with a “slight” addiction to Photoshop! I have a vast collection of photography that I often use in my cover designs. 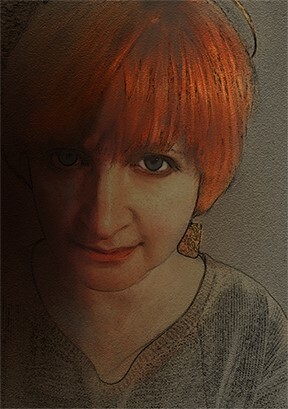 One ­of my favorite things to do is enhance a photo so that it looks like a drawing or a painting – and that makes it a one-of-a-kind image for the author. 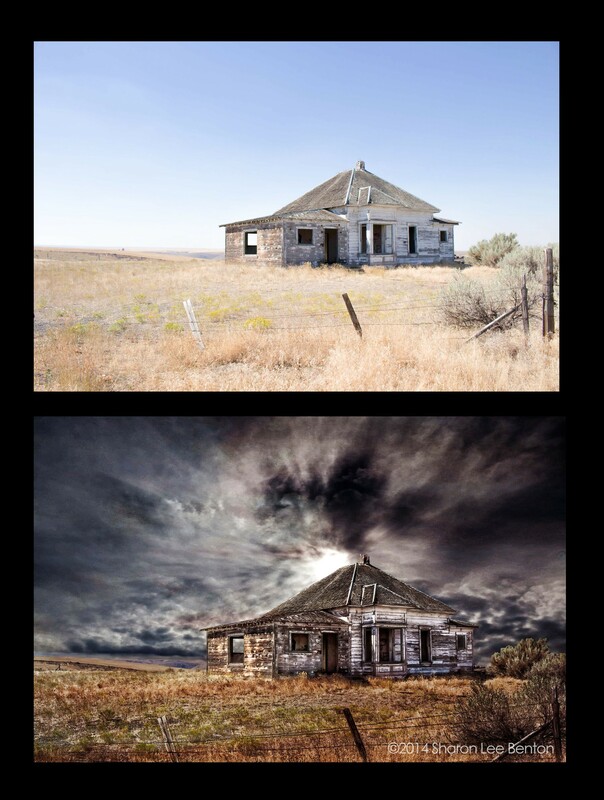 Here’s a before and after of an old prairie house I took in eastern Oregon. You can see more of my work at www.Q42Designs.com. What advice would you give to authors when shopping for a cover designer? Understand upfront what costs will be and what is included in the price – is there an additional charge for researching artwork? How many revisions are included? What is the price difference for an e-book cover vs. print? What deliverables will you receive? I think it’s really important to work with a designer with whom you have a good rapport, since you will be collaborating on this project. To find a cover designer, talk to authors whose covers you like and ask who their designer is. You can also search the web for cover designers and look at their portfolios. Your designer should create a cover that is a reflection of your story-line and genre. There was a big controversy a few years ago over a new cover design for “Anne of Green Gables” — the innocent freckle-faced redhead was portrayed on the cover as a buxom blond! Be sure your designer knows your book and understands your audience. Please take a minute to check out Sharon’s website! You can see a short informative video at www.Q42Designs.com that illustrates her process and get a snapshot of her work. We’d like to thank Sharon for participating in our guest interview. This entry was posted in Uncategorized and tagged author interview, book cover designer, book festival, book promotion, Goodreads Giveaway, guest interview, Horror Fiction, Litzophreniacs3, Northwest Book Festival, Renna Olsen, science fiction, Sharon Benton. Bookmark the permalink.